In Northeast Nigeria, internally displaced persons (IDPs) and host communities bear the brunt of the multiple impact of the current crisis. Most of displaced families have very limited resources to cope with and need urgent livelihood support. Usmane is a 30-year-old farmer who fled his hometown three years ago, immediately after his neighbors were attacked by Boko Haram insurgents. Since then, he has been living with his family in the Kasesa IDP camp, in Yobe state. After his arrival, even though he felt relieved to have found a safe place to live, he felt trapped in a spiral of destitution. “I tried to work, to do casual work to make some money, but it was not sustainable. At one point, I had to sell my livestock to buy food for my family” he said.Although he was granted access to land by his host community, he was lacking the seeds he needed to engage in farming. This year, Usmane received an agricultural kit from FAO, comprising seeds of vegetables in high demand on the local market and fertilizers. His crops are now growing and he looks forward to the harvest: “It is a huge change; we will soon cook our own food! And I also hope to sell watermelons and okra at the market and along the nearby road” he said. Balama, a community leader living in Kasesa village, explains: “This assistance from FAO was a relief for all of us. The first people arrived here three years ago. They came from Gujba, Zarmari, and from many other places. About 700 families arrived here. We helped them with food and water. The SEMA and NEMA also assisted them. Some of us even gave them shelter, and access to our land until they can go back. But we couldn’t afford to take care of all their needs”. 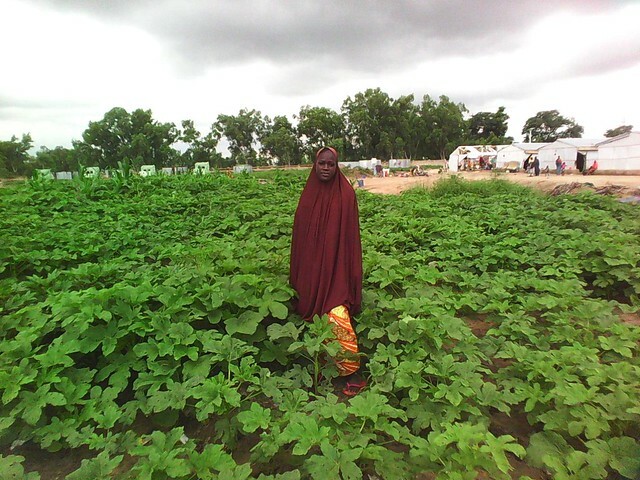 In total, 3 000 households (about 24 000 people) are benefitting from FAO assistance to engage in vegetable production and marketing in Adamawa, Borno and Yobe states, thanks to the financial support of the Government of Japan. A total of five tons of seeds of fast-growing local vegetable crops including okra, watermelon, amaranth, roselle and sorrel, and 45 tons of fertilizers were distributed to crisis-hit beneficiaries. This assistance will help IDPs and their hosts diversify their diets and improve their nutritional intake especially for children, by increasing the availability and consumption of vitamin- and mineral-rich foods. It also represents a unique opportunity for deprived displaced people like Usmane to earn income by selling almost 80 percent of these farming products, as the vegetable production scheme is far above households’ consumption needs. Support to nutrition-sensitive food production is crucial to help the displaced and food insecure families and host communities engage in a recovery process. More funds are urgently required to implement a large-scale livelihood support programme based on irrigated vegetable growing and micro-gardening.